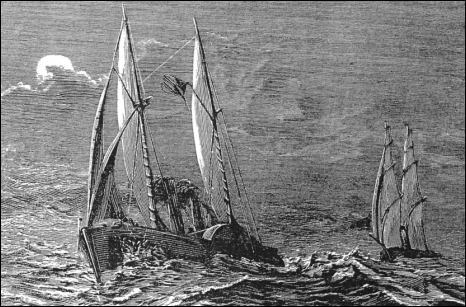 Late at night on October 30, 1873, a lookout on the Spanish corvette Tornado spotted the smokestacks of the Virginius in the distance. "We followed her," wrote Captain Dionisio Castillo in his report to Madrid, noting that the ship "changed her course to South-East by South." (Walker) After daybreak, the Spaniards continued on course, noticing the mysterious Virginius dumping cargo and increasing speed. "There was great activity on board," wrote Captain Castillo of the Tornado, "the whole of the steam power from all the boilers being brought into requisition." At about 2 pm the Spaniards were able to identify the Virginius, and "commenced to give chase." (Walker) "The position and course of the vessel," wrote Castillo, "led me to believe that this craft was none other than the filibuster Virginius. I instructed the engineer to carry on all steam possible, and drive our vessel through the water as quickly as he could." By about 9 pm, after an 8-hour sea chase, the Tornado approached the Virginius, firing five shots, and sending two boats full of Spanish soldiers under the command of Don Enrique Pardo and Don Angel Ortiz Monasterio. While preparing to board the Virginius, Ortiz noticed the numerous men on board, and shouted that "any aggression on their part would be energetically chastised by our forces." (Walker) Upon boarding, Ortiz demanded to see the Captain. "This is an American ship," said Captain Fry, "She has American colors and American papers, an American captain and an American crew. We have neither arms nor ammunition on board; we have only passengers, and are going to Port Limon, Costa Rica." (Walker) The Spaniards didn't believe this for a second. Among those arrested were Captain Joseph Fry, General Bernabe Varona (aka Bembetta), General Pedro Cespedes, General Jesus del Sol and Brigadier General George Washington Ryan. On November 4, four days after the Virginius was captured at sea, General Varona, Cespedes, del Sol and George Washington Ryan were executed by firing squad, having all been tried as "pirates" and sentenced to death. In Washington, during a presidential cabinet meeting on November 7, Secretary of State Hamilton Fish received a telegram informing him of Ryan's execution a few days earlier. 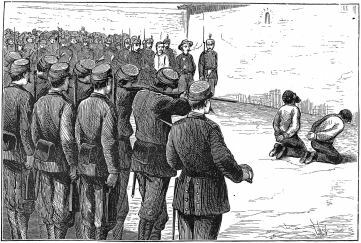 At eight o'clock that same morning, in Santiago de Cuba, Captain Fry and 36 other were executed by firing squad after a court-martial aboard the Spanish warship San Francisco de Borja. 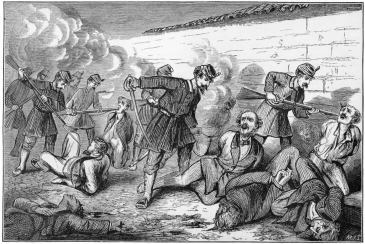 Bradford describes the execution; "A ragged volley flashed toward the men. Fry fell forward, dead at the first fire. Others were still standing, leaning against the wall. Some bent forward. Many were on the ground in agony. Poor marksmanship and nervousness had made a butcher's job. Some of the squad rushed forward to administer the coup de grace and shoved muskets into the men's mouths. Shooting continued for five minutes until thirty-seven men lay dead in heaps before the wall. To American sailors in Santiago harbor it sounded like fireworks on the Fourth of July. A wagon drove up, the bodies were piled on hastily, and it drove off." (Bradford) The execution was reported in the December 5 issue of the New York Times.